Sharp cuts in federal funds for groups that help people sign up for Obamacare plans will result in less outreach and staff layoffs, a survey issued Oct. 11 by the Kaiser Family Foundation found. The advertising budget for the 2018 open Affordable Care Act enrollment period is being cut from $100 million to $10 million, and funding for navigator assistance groups is being cut 39 percent from the $62.5 million allocated for 2017, the Department of Health and Human Services announced in August. Those cuts have come under fire from ACA supporters who say they are attempts by the Trump administration to sabotage the exchanges, which face sharp premium increases and withdrawals from some insurers for 2018. Funding for the navigator program in the 34 states that use the federal HealthCare.gov enrollment website is slated to be cut 41 percent, the KFF report said. Funding will be based on individual programs’ performance on enrollment goals set by the groups the previous year under the HHS’s August guidance. For 77.5 percent of the programs, funding changes didn’t correlate with the number of consumers assisted in selecting qualified health plans, the KFF report said. Forty-nine percent of survey respondents reported the government didn’t provide a reason for their program’s funding change, and the rest of the respondents said the reason wasn’t clear. In its August announcement, the HHS said 78 percent of navigators failed to meet goals from the previous year for enrolling people in qualified health plans. The KFF conducted an online survey of the 94 navigator programs in 34 states Sept. 22-Oct. 4, and 48 programs in 32 states completed the survey. The KFF and the Robert Wood Johnson Foundation also hosted a navigator roundtable meeting with more than 40 navigators Sept. 15. Shouldn’t Insurers Spend Their Own Money? There is a debate about whether health insurers should spend more of their own money to market their products. “This happens in every other product line in the world,” Joel White, president of the Council for Affordable Health Coverage (CAHC), told Bloomberg BNA Oct. 11. The CAHC, which works for lower health-care costs, comprises insurers, pharmaceutical manufacturers, employers, physician organizations, and consumer and patient groups. “We want the plans to tell you about the plans they have available,” White said. “Why is that a taxpayer responsibility?” The CAHC neither endorsed nor opposed the ACA, but White called it a “flawed law” in a recent editorial. “We believe that effective education ensures that consumers understand their coverage options and encourages broader participation of healthy individuals,” Cathryn Donaldson, spokeswoman for America’s Health Insurance Plans, said in an email to Bloomberg BNA Oct. 11. Marketing and outreach are critical to ensure consumers are aware of the upcoming open enrollment period and understand new deadlines, she said. For 2018, the sign-up period will be Nov. 1-Dec. 15, half the time allotted for 2017, when 12.2 million people signed up. A group of former Obama administration officials who have formed their own enrollment outreach organization argues that the new, shorter deadline and outreach budget cuts create formidable obstacles to getting people signed up for 2018. The advertising cuts will be particularly damaging to the effort to enroll people who don’t have coverage, Josh Peck, co-founder of Get America Covered (GAC) and former chief marketing officer of the HHS’s Health Insurance Marketplace for the open enrollment periods for 2015 through 2017, told Bloomberg BNA. “I would welcome insurance companies doing advertising of their plans,” Peck said. But government assistance may be less biased than assistance from companies selling plans, although navigators aren’t allowed to give advice on which plans to pick, he said. Instead, navigators can help people determine their eligibility for subsidies, and provide advice on factors to consider in picking a plan, he said. Government spending on outreach is also more effective on a dollar-for-dollar basis, Peck said. Health insurers typically spend between $200 and $2,000 to enroll a new customer, who they may keep for a long time, he said. In contrast, it only costs HealthCare.gov $30 to $50 to enroll a new customer, he said. GAC has a “growing, six-figure budget,” Peck said, but he declined to give a specific amount. The group will base its activities on the amount of money it is able to raise, he said. It will concentrate first on digital ads, such as ads run on search websites like Google. “The question is do we have the ability to raise enough money to do anything more than that,” Peck said. If GAC is able to raise enough money, the next step would be to run television ads, which can cost “well into the millions of dollars to do it well,” he said. The group plans to concentrate its activities on the final weeks of open enrollment, Peck said. That’s when enrollment typically peaks, particularly for younger enrollees. A major problem for the marketplace has been that it has attracted older, sicker enrollees who cost more to cover, and not enough young, healthy enrollees. 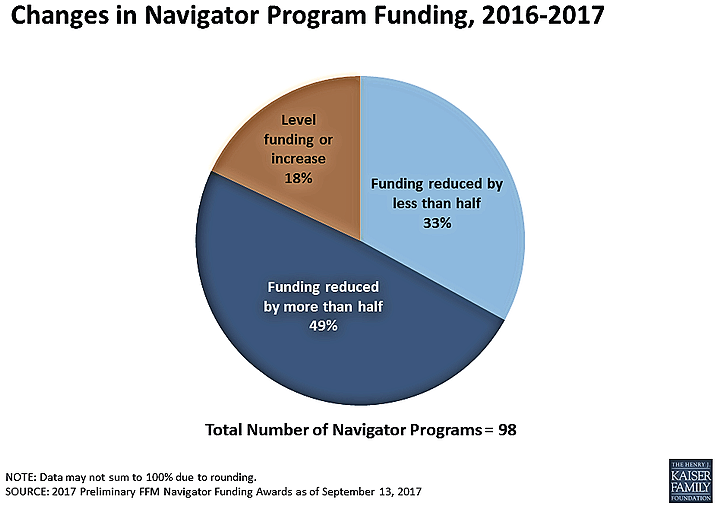 Kaiser Family Foundation's Survey: Adjusting to Sudden Reduction in Federal Funds, ACA Navigators Expect to Decrease Services is at https://www.kff.org/health-reform/issue-brief/data-note-changes-in-2017-federal-navigator-funding/.Policies Related to the Navigator Program and Enrollment Education for the Upcoming Enrollment Period is at http://src.bna.com/sbN.